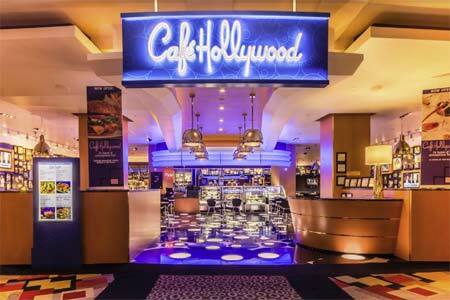 Twenty-four-hour café goes beyond expectations in its expansive menu, food quality and décor celebrating the 25-year history of Planet Hollywood. 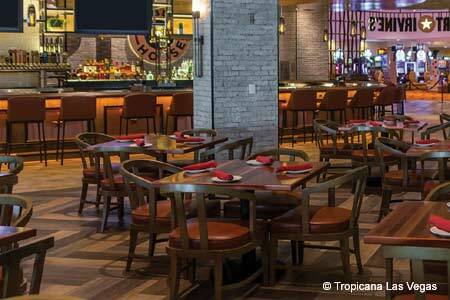 About the restaurant & décor: This is not your run-of-the-mill casino café. Décor features tributes to all things Hollywood, with videos and photographic montages of entertainment moments covering nearly every inch of the walls. Likes: The Pastry Shop, located in the center of the restaurant, offers grab-and-go pastries, coffee and seven flavors of gelato. Dislikes: The restaurant is located right off of the casino, so if you find this distracting, ask for a seat further back in the space. Food & Drinks: A portion of the breakfast menu is offered all day; the Las Vegas scramble comprises three eggs, spinach, mushroom, red pepper, onion and Swiss. Appetizers include the High Roller sampler with chicken crunch (Demi Moore’s recipe), Texas tostados (topped with BBQ chicken and cheese), Buffalo wings, five cheese dip and tempura jumbo shrimp arranged on a wheel representative of the Vegas landmark for which it’s named. Burger fans can opt for the ½-lb Hollywood topped with pork belly and fried egg. Pastas are well represented by the deep-fried L.A. lasagna. Unique to this location are ten Asian dishes (the honey walnut shrimp is a winner). Rounding out the menu are specialties including the 12-oz. Black & Bleu NY strip, BBQ ribs and blackened mahi mahi. Forty-five wines are available (Caymus Cabernet, Chalk Hill Sauvignon Blanc); among locally brewed brews is Las Vegas Lager from Big Dog’s. Save room for one of the supernova milkshakes, which are topped with treats such as cotton candy, chocolate brownie or birthday cake.